Replacing a roof is a big expense, which is why it’s so important to have homeowners’ insurance in place. It’s equally important to fully understand your policy; not only what you’re entitled to if you need to make a claim, but also what to expect by way of limitations. In this blog, read about 4 reasons your insurance carrier could deny your claim for a roof replacement. If your roof is extremely old, it may be time to review the limits placed on your policy. Every carrier views the age of a roof differently, but many companies are decreasing their liability by setting age limits on roofs. If your roof is older than 20 years, many insurance companies may refuse to give you a policy or renew your existing policy. Be sure to check with your insurance company or agent to see if you need an inspection done or a total roof replacement. Older roofs are more likely to be deficient. However, even newer roofs can have issues. If it’s determined that your roof was deficient, thus causing other necessary repairs, your carrier may not cover your claim. If your roof leaks, it can lead to other problems if left undetected, such as mold, sheetrock damage, and damage to interior furnishings. Some insurance carriers are limiting coverage based on roofing materials used, such as wood shakes. Check with your carrier to ensure they will cover a replacement of the type of materials used to construct your roof. 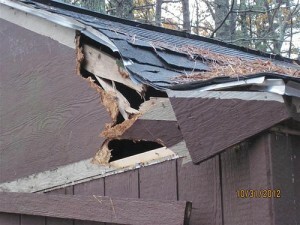 Some carriers are refusing claims if the damage to a roof is purely cosmetic and not structural. Do you have questions about the integrity of your roof? Perhaps it’s time you had a roofing inspection or a roof replacement. The Chuba Company has had the same crew of seasoned professional roofers who are ready to help you. We are also GAF Master Elite certified contractors and hold an A+ rating with the BBB. The Chuba Company has the experience you need in working with insurance companies to ensure you get everything you’re entitled to through your carrier. Though the Northwestern Minneapolis suburbs haven’t been hit with a major storm yet this summer, the “big one” could be right around the corner! Contact us today to ensure your roof is ready for when that happens! Follow us on Facebook, Pinterest, and Houzz to get our weekly blog updates and see examples of our quality craftsmanship!